Opening in 1966, Limerick’s Club a Go Go was a much-loved membership only ‘ beat Club’ frequented by a dedicated clientele. The club was notable for holding DJ only nights alongside live gigs by visiting beat groups. Recognising that the look of the culture was equally as important as the sound, fashion competitions occasionally took place as well. Club a Go Go was unofficially known in Limerick as ‘the Go Go club’ and held its reputation as a vital hub until its closure in the early 70s. For this duration its members created a social model that refused to be bound by the rituals of the traditional dancehall and its associated codes. The Go Go club promoted a collective scene of equality instead of an updated version of showband-led rituals. The city centre two-storey premises remains in Post Office Lane and has functioned as Cummins picture framers for almost 40 years. Each year Kevin Cummins greets former patrons of the club returning to a space they once had a stake in. The Go Go club now registers as an international outpost that was wished into place by 1960s Limerick teenagers who had begun to see themselves as Irish who could engage with an international culture in a local environment. The application of ‘beat’ style was political in the sense that it evoked youth led empowerment in social structures that were organised and run by the members themselves. Looking further than the designated horizons of Irish dancehalls, the Go Go began to reference and apply foreign sounds and styles to cater for its unique membership. The implied modernism in this act treated patrons as active participants in a social project as the club became a space of their own design. To this day its members respect the memories of this concept and the space it was acted out in. Visitors hope the original décor is still in place to greet them in what is now Cummins workshop. Some have been known to introduce themselves always using a version of the phrase, ‘I’ve come looking for my youth’. Today the interior functions as the framing workshop and a stained glass studio, but hints of the Go Go remain as the original toilets near the entrance. Spectacularly some of the original psychedelic markings are still to be found on upstairs walls now separated by an added floor. 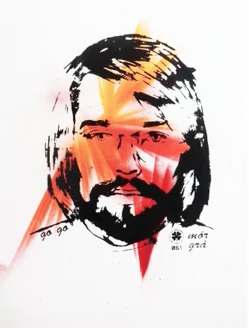 This is the actual Go Go graffiti. When Kevin retires, it is very possible that these original traces will disappear and with this in mind he has become a curator of the space. He now manages an ongoing oral archive of stories of the club collected and shaped by both locals and visitors from abroad. To pay tribute to this activity using the tone of quiet memory invested in curating the concept of the space, I collaborated with Kevin Cummins and the print maker Eoin Barry to create a commemorative act of portraiture that would be framed by the Go Go club. This act is linked to the creative opportunity afforded by the multi-locational exhibition ‘ The Act Of Portrayal’, part of the University of Limerick’ 40th anniversary celebrations. 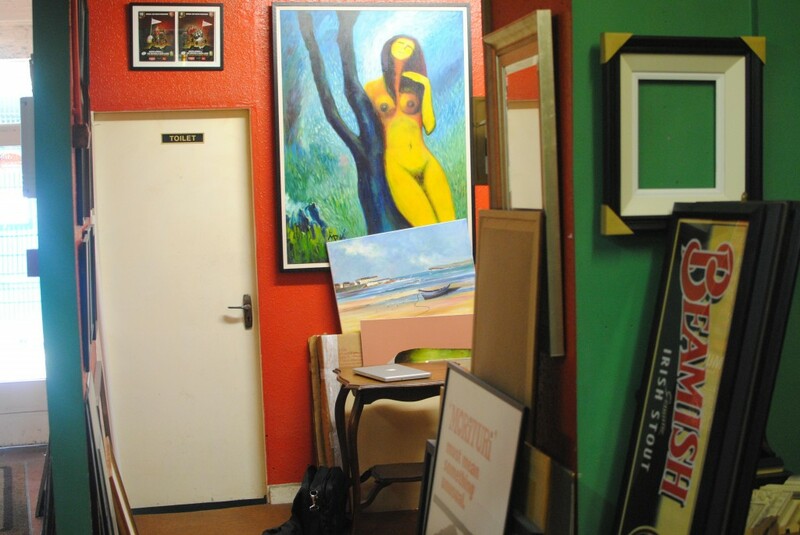 The remit for this event allowed artists to choose work from the National self-portrait collection for interpretations to be exhibited alongside the originals in venues across the city. Members of the Limerick Printmakers were among those invited to participate in this process. With the Go Go club in mind I chose to work with an image of the artist Robert Ballagh, because he once played as a beat musician in Limerick circa 1966. His band was called the Chessmen and with Ballagh on bass guitar they played at Royal George hotel in O Connell Sttreet, a short distance from Post Office lane. Ultimately Ballagh’s vocation was a visual artist and he left The Chessmen in the late 60s to become, as he said of himself, ‘Ireland’s only pop artist’. To create the work for the Act of Portrayal titled ‘A commemorative portrait of the Irish Artist Robert Ballagh imagined as a beat music star for the remnants of Limerick’s original beat Club. (Club a Go Go 2013)’ Eoin Barry looked at some of the remaining visual elements associated with the club and sought visually to reimagine a history that would represent the psychic hold it has on the generation who continue to visit the site. He began by studying the original traces of the club’s psychedelic markings, and then examined mark-making in the process of stamping that Ballagh used in his printmaking. Eoin also referenced Ballagh’s use of screen-printing for his initial acts of portraiture. 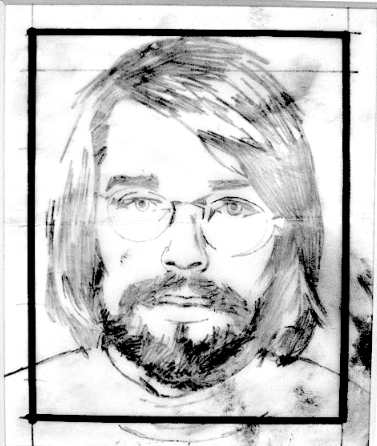 Ballagh has admitted that an early portrait commission drew on the conceptual practicality of Warhol’s silk-screening photographic images directly on to the canvas because, starting out as a professional artist, he was unsure about ‘doing faces’. Referencing a combination of these factors we decided to silk-screen Eoin’s version of the Ballagh from the National Self-Portrait collection directly onto what was the original toilet door of the club. 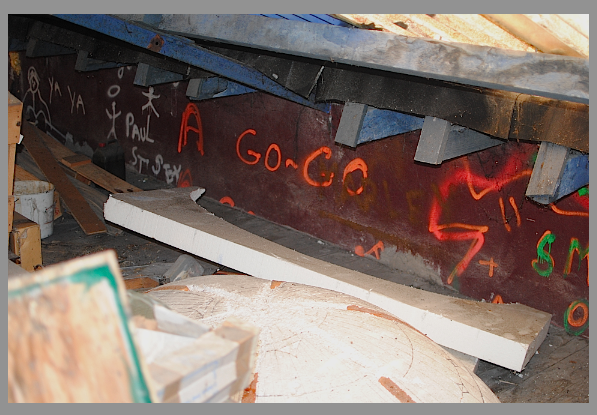 The intended effect is one of and image of an imaginary beat star left behind in the Go Go club by a fan. By coincidence the bearded face in this image now gazes at an original Ballagh print hanging across from the door. This lithograph is from Kevin Cummins private collection. It depicts a cigarette packet commissioned by an Irish Company as a gift to its salesmen in the 1980s. For the resulting photographic series based on the construction, Kevin suggested that the workshop space should be visible. This was made possible by using the mirror behind the toilet door to reflect the wider space. An image of Kevin at work as a framer now appears as a reflection in one of the three photographic images. With this in place, with an emphasis on the classical illusion facilitated by the mirror, our construction alludes to a type of busy pictorialism often found in the more familiar pieces by Ballagh. When undertaking portraits he has been known to encourage biographical readings of the subject suggested by the relationship of particular objects to the sitter. For display in the Limerick Printmakers I photographed three images to be finished as silver halide prints. 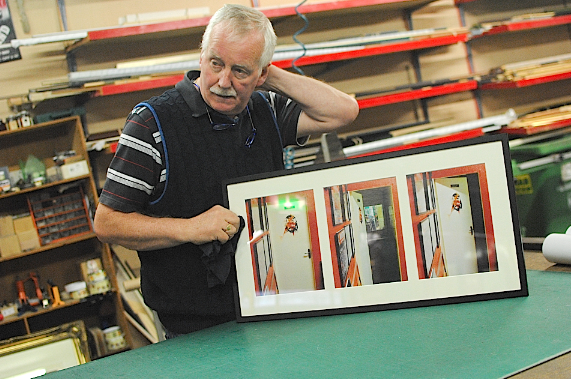 Kevin, who has framed many prints of Ballagh for customers over the years, framed them himself. The intended narrative around this commemorative portrait is built on a desire evident in how the memories of Club A Go Go are managed. Urban Irish people in the 60s acted out such a desire with its roots in post-war creativity and ambition. This is what made the space of the Go Go Club important. The youth in Limerick embraced, as Ballagh did, an equal appreciation of both outsider music and the plastic arts as expressionist material they could claim as their own for their own land. As the years pass the psychedelic traces on the walls confront visitors like relics. They were designed and applied for the space by the patrons themselves. This was a generation not bound by the narrowness of the national dances of De Valera’ s self-contained vision. This was a Limerick-based mod identity, looking for inspiration towards Britain and the US. It is to commemorate this idealism that some people continue to return, now often living in those same countries, 50 years later. 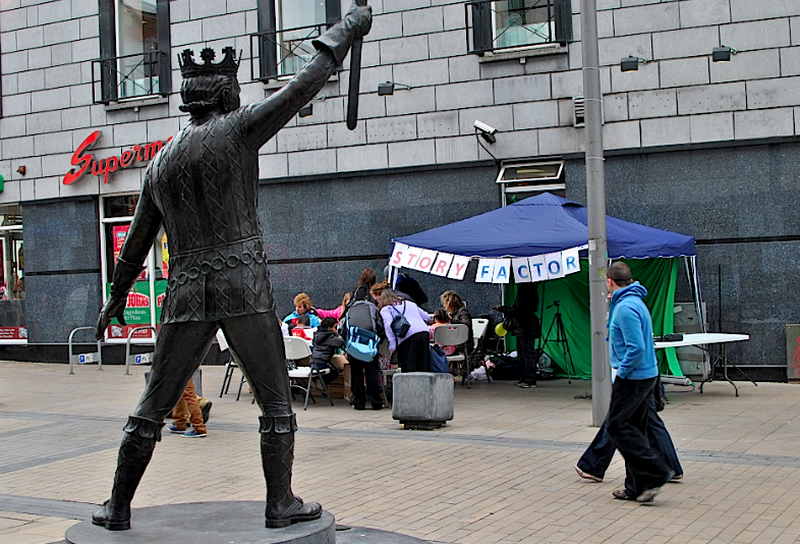 The Statue of Richard Harris in Limerick City is an unsure monument to a Limerick-born actor and sportsman. It may be said that the consequences of an agenda surrounding its construction have denied the city an open / lateral reading of his legacy. Instead decisions taken and managed have supported a fixed solution that serves a commercial rather than a public site. Issues of place, managed space and what Marc Auge called anthropological places (areas that contain memories of previous places) are suggested in this investigation of the complex circumstances and consequences of the idea of Richard Harris in a Limerick context. As designated modules in a city, monumental markers continue to visualise the dominant material relations represented primarily by civic and mercantile interests. Marx and Engels mentioned that the ruling classes came to manage the ‘ideas of mental production’ over those who, they determined, ‘lacked the ability to do so themselves (3). Grant Kester remarks of modernism that ‘we understand the work of art in the context of a system of given cultural and historical constructs that construct the category of ‘”art’” as a repository for values actively suppressed within the dominant culture’ (4). The obvious but understated fact is that if questioned, those who commission and direct the construction of didactic or mimetic representations in the city may find that in the end, their endeavours have ‘less to do with the lessons of history than the (actual) construction of (a) cultural identity’ (5). In his book The Image of the City, Kevin Lynch discusses the open position of vernacular landmarks as geographic markers. He speaks of a ‘coincidence of association and imageability’ when a landmark ‘coincides with a concentration of association’. (6). It now becomes the process around location that is the key context for this conversation on the fixed and the vernacular map points. Both organised and disorganised travels in urban space make use of a combination of private and public monuments as markers. These beacons continuously dissect paths for both consumers and wanderers and it is in a matrix of these travels that a cityscape primarily accounts for itself. Traditional landmarks exude fixed meanings but Lynch also draws attention to the cartographical significance of the vernacular objects that exist alongside monuments. They exist alongside the sponsored or commissioned units: the city’s uncommissioned or detoured objects that function both as physical and psychological markers. While the use value of the fixed monument is based on a subjective passivity, it is in the user dialogue between official and unofficial points occupied by the fixed, transient and virtual monuments that the true psychic map of a place exists. These combine in what the Marxist geographer Doreen Massey calls extroverted space. In recognising this dialogue a particular investigation of space now invites a more complex reading if location politics and aspects of place are brought to the fore. In the introduction to ‘The Practice of Everyday Life’ Micheal de Certeau suggests guidelines for such an inquiry. ’The presence and circulation of a representation (taught by preachers, educators, and popularisers as the key to socioeconomic advancement) tells us nothing about what it is for its users. We must first analyse its manipulation by users who are not its makers. Only then can we gauge the difference or similarity between the production of the image and the secondary production hidden in the process of its utilisation’ (7). FIXING AN IMAGE OF RICHARD HARRIS. The subject of interest is a bronze representation of the Limerick-born actor Richard Harris fixed in the commercial environment of Bedford Row in Limerick City centre. Fashioned in a realist manner by the Limerick sculptor Jim Connolly, the statue was commissioned by the city council in 2008 as an integrated focal point for the €3 million Bedford Row regeneration process. The council had mooted a commemoration to the popular Limerickman for some time. Once the regeneration began, agendas were integrated and the statue was included in the process now as the figurehead of the Bedford Row project. Everything regarding the subject matter and management of the statue as well as issues arising from its intended location was channelled through a group called the Cultural and Environmental Strategic Policy Committee. 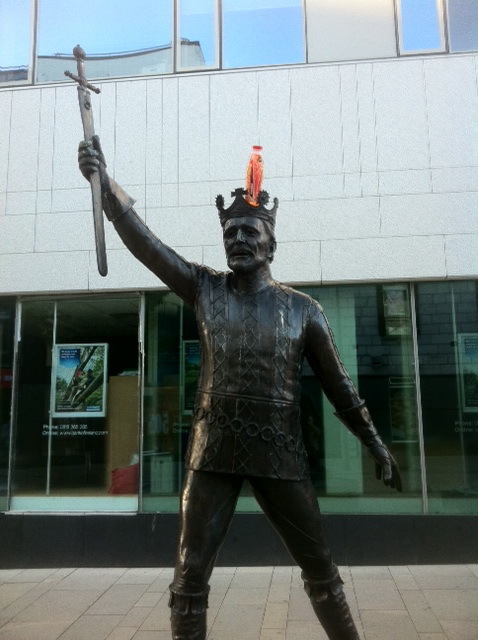 A decision was made to create a monument to Harris by rendering his image in the character of King Arthur from his first major film role, a British musical of 1967 called Camelot. The bronze is reputed to have cost €150,000. Connolly’s statue was unveiled in 2008 to some criticism (5). The Limerick press reported that members of Limerick’s Art community questioned its size, shape and poor resemblance to the actor. The painter John Shinnors spoke here of a ‘missed opportunity’. Unfamiliarity was an expressed concern. The Limerick public expected to experience at least a celebration of his sporting background via a solid visual reference linking Harris to the active culture of rugby in the city. This expectation was fanned by newspaper polls combined with the knowledge that a statue of Harris as a young racquetball player was already struck in Killkee Co Clare (2006) (8). A small concession does exist in the understated plaque at the base of the Bedford row statue. It references Harris in character as a rugby player in the Oscar-nominated film ‘This Sporting Life’. By its size and understated placing, this touch is both an acknowledgement and a denial of the rugby content of his legacy in bronze in Bedford row. It appears as a badge on the sleeve rather than the full uniform. Holding an inverted sword with a proclamation of peace inscribed at the base, this interpretation of Arthurian legend as delivered in the film Camelot became the figure that was unveiled to the Limerick public in 2008. However, a combination of the commercial location of Bedford Row and the unfamiliar, relatively obscure, film reference invited a certain amount of confusion. Physiognomy suggests the notion that identity can be divined from external appearances and public expectations were high that any representation of Harris would in some way channel many aspects of his public life. His multi-dimensional legacy was very much in the public domain. How to represent the totality of such an individual without compromise in the traditional format is another matter. Yet it was the assumption that some attempt would be made to tackle this as a brief. The Limerick Leader newspaper ran a poll asking what type of (conceptual / biographical) ‘material’ should be considered as sculptural commemoration. (6) The paper deduced that there remained the sense that people now wanted a physicality associated with the Harris myth. They wanted to see him, to put meat on the bones of the many tales about him that are passed around the city. Because this was no forgotten individual of the past, this was a sportsman, actor, singer, poet and a Limerick man of living memory. 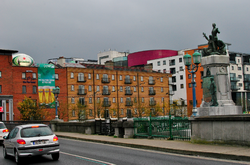 The concept of creating a monument celebrating popular Irish entertainers was common in 2008. In 2005, Dublin unveiled a city centre bronze of the Irish rock star Phil Lynott and this quickly became a popular locus for fan and tourist appreciation. Around this time the concept of an Irish entertainer existing as commemorated icon began to impact on the thinking of local authorities where previously the concept had been unknown. It now made sense to respect the process of rendering contemporary references in public as they could be justified under a progressive commercial agenda. These units spoke for the currency of certain spaces and the remit of remembrance widened to include commercial ‘spin-off agendas. The one per cent for art scheme introduced by the state facilitated some populist / fan-led applications that previously would have remained within particular communities of interest. The bronze of the guitarist Rory Gallagher in Donegal is another example of this. The actor and celebrity friend of Harris, Russell Crowe, unveiled the Kilkee statue in 2006 and his presence for this generated much interest. The subtext in the media coverage at the time was to stoke a dramatic Harris / Crowe / Rugby / Hellraiser mix around the ceremony. This was always a convenient commentary which encouraged a mythical reading for an audience sympathetic to both men’s chat show personas. Once the news that a statue of Harris was proposed for Limerick, the interest and sentiment for it was high. It began to be willed into existence as a totem that would function on many levels. In overall discussion there was the primary expectation that a representation of the actor would operate as a type of shrine that would accommodate the city’s relationship with rugby in a traditional fashion. To have this marked as such would be as important as any recognition of his acting legacy. There is a decorative factor to Limerick city driven by the rugby-themed advertising as building-sized jerseys and inflatable promotional material dot the city centre when matches feature in Thomond Park. However, before the prevalence of alcohol companies’ sport sponsorship began to visually impact on the city there was another act by the city to officially draw attention through the medium of sculpture to the profile and civic relationship that it has with Rugby. This was the Munster Trail, a means by which a wandering participant would traverse the city centre and be led to the sacred ground , the home of Munster Rugby. This was more of a tangential conversation with the subject and any conceptual idea of sculpture to facilitate a brief appears to be undertaken at planning / city architect level. The evidence for this rests in the shape of the posts which are variants of the street barriers generally used by the council. By choosing these pre-fabricated modules as basic markers to sketch out this commemorative path it appears that any other aesthetic / conceptual considerations for remodeling have been ignored. There are examples where city authorities have supported civic boundary projects that have featured similar ‘posts’ and incorporated conceptual material. Often there is a superficial overlapping of form between street furniture and urban sculpture with particular durable materials as a common factor. 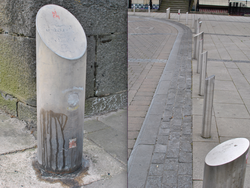 Today a neglected ‘Munster trail’ remains and a collection of anonymous unmaintained stainless steel stubby posts, some with a faded Limerick City logo attached, functioning neither as sculpture, street furniture nor signage. Another anonymous and unbranded example hangs across from Colbert station. It is a banner that covers the front of a closed building. Here the outline of a rugby player is rendered in white against the photo background of cheering Limerick fans. The accompanying text reads simply ‘The 16th Man, Limerick city’. At the base of the banner, a surveillance camera is focused on the neighbouring Casino giving the site the unplanned appearance of a contemporary Art piece or a sort of sculpted movie billboard. When the banner and camera are read as one the effect is to re-focus attention on the white outline, which now appears as a figure trace from a TV crime drama. Branding would have managed the banner’s intended celebratory meaning but in the absence of a logo or maintenance either from the city, the corporation, or an alcohol company, the identity of 16thman is visually problematic when it is read as a ‘greeter’ to the city. This is accentuated because of the banner’s location. Subliminally visitors may ponder this. Charlie St George’s bar at the base of this exhaust-covered banner is also of interest here. It highlights a personal touch that is located in the site. 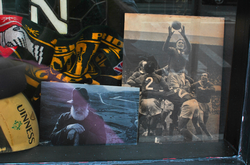 A small window display has been organised in e window with rugby-related material paying tribute to past teams and games in the city. To the right of this display is an understated postcard-sized image of a stern bearded man leaning on a staff in the countryside. It is Harris, not in a sporting pose but in character from the film The Field. Regarding the site, visitors are encouraged to make the link between the man and the place. His portrait is almost colours hung in pride (9). Entering the bar itself (as Russell Crowe did) you will be told that it has a long tradition with Young Munster, Harris’s beloved club. At present (until legislation dictates otherwise) it is primarily the alcohol companies who remain keen to develop brand relations with the city via rugby as their promotional budgets allow the spend for it. Each year promotional displays compete with each other on the street and become ever more prominent with each event. On match days, huge branded jerseys cover buildings and inflatable goalposts on pub doorways facing public thoroughfares become commercial monuments for citizens to navigate around. This temporary branding of the city centre is seen as a positive in civic discussions as the financial benefits that surround the game will always be seen as a benefit to the city. On big match days there is a sense of religious fervour as locals and visitors walk together from the city centre (through Bedford Row) towards Thomond Park. The linking of the passion of Rugby with Limerick civic pride is regularly echoed in the promotional language of the alcohol companies’ material and this buy-in is largely unquestioned. The sociologist Erik Cohen in a definition of pilgrimage, defined the process as a movement from the ‘profane periphery’ to the ‘sacred centre’, while tourism by contrast, involves a movement from the cultural centre to the periphery, or to the centre of other cultures and societies (10). This contraction is in itself a definition of place and its dynamic again accesses de Certeau’s description of the production of image. There are relics in the holy space too. The Museum in Thomond Park holds a letter written by Harris to the producers of a film he was signed up for. In it he asks to be excused from filming for the weeks of certain Munster matches. THREE CONSIDERED CHOICES FOR A COMMEMORATIVE IMAGE OF RICHARD HARRIS NOT IMMEDIATELY EVIDENT IN REGARD TO SITE. 1. The Bull McCabe. The familiar. Before his late career success with the film The Field, Harris was paying a price for decades of unsatisfactory career choices by touring a stage version of Camelot. While lobbying for the lead in The Field he was at the same time acting in a stage version of Camelot, a theatrical self-commemoration of sorts based on a role that initially brought him fame. Parallel with the Youtube clips of his talk show appearances, the most popular tribute to the man is continuous (9). It is the yearly reruns of The Field on Irish television. In this award-winning role he channels The Bull Mc Cabe, a patriarchal farmer in this rural Irish psychodrama. Reviews of his performance tend to locate the character of The Bull in the familiar theatrical language of a romantic landscape. Earthy terms such as ‘his craggy features’ abound in the descriptive shorthand that links the theme of the man with the land familiar to Irish rural drama since the 18th century. John B Keane, the author of the play ‘The Field’, based the story of blood attachment to land on a real-life incident of murder decades previously. This fact may have accounted for the council downplaying the possibility of a bronze of the character ‘Bull’ being cast in memory of Harris. Once anointed, places that ‘stand in for others are encouraged to reflect on the experience and to regard their own landscape in the narrative of the finished film in the language of the tourist economy. These well-known films construct virtual environments and become living monuments to imagined spaces. Communities are proud, and even thankful of the association with the dream factory that simplifies the complexities of a rural Irish environment and then manage the consequences within tourist boundaries. This is the tradition of Irish film locations inviting the identity of an imagined Irishness once a production has wrapped. An actual working village ‘’Kirrary Town’’ near Dingle was created for the film Ryan’s Daughter (Harris was considered for the role of a British Major in this). The village was donated to the community afterwards and the remaining stones of this gift are still visited as curiosities. Continuing interest had led to a nostalgic documentary on the making of the film and the surrounding area. The same Kerry site was used in 1991 for the film Far and Away. Less subtle is another clash of signifiers in Galway. 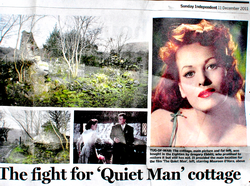 The City hosts a mural of John Wayne and Maureen O Hara who are pictured in combat from the film the Quiet Man amongst a collage of shops and supermarkets. A business rendered here is again the ubiquitous Burger King. This mural remains as a tourist-contemplated artwork that celebrates both the Quiet Man and contemporary consumer choice in a city centre location. Other examples are towns of Avoca and Enniskerry in Wicklow, which maintain continuous associations with the British TV series Ballykissangel. An image of Harris playing the character the ‘Bull’ McCabe was chosen by An Post to commemorate 100 years of Irish Cinema as a postage stamp in 1996. The exposure from this choice is significant in how the image of Harris the actor is currently held in Ireland. A mention of The Field remains on one of the insert plaques at the base of the statue. This particular insert is placed (out of sight) at the back on the base of the figure of Arthur. 2. Hail fellow well met. In Limerick, Harris’s generosity of spirit is never more than a glass away, particularly if in company with men of his generation. One of his contemporaries, while referring to the amount of former Limerick rugby players who claim to have broken Harris’s nose in a game, remarked ‘it’s a bit like the patriots who say they were in the GPO in 1916, there’s more of them each year’. Everyone it seems is obliged to have a story about some shared adventure with the man in the 60’s and 70’s. Tales build other tales and in retelling the anecdotes are grafted together in a collective bond. This is in no small way helped by television repeats of the Late Late Show where Harris’s appearances have become embedded into public consciousness. With regularity, TV hosts such as The Late Late Show’s Gay Byrne framed and stoked these ‘wild tales’ as reified entertainment for a mass audience. Consequently people were invited to believe that they ‘knew’ Harris. The Irish have responded to this managed role admiringly and possibly more so than any character Harris professionally played on screen. The image/cliché of the rebellious wayward creative, localised and fêted both as Irish and as a character on Broadway can perhaps be traced back to the reception afforded to Brendan Behan at the height of his fame. Sometimes stories don’t even need to be true. Around 2008 a character in Limerick had a routine for seeking free drink in city centre bars by pretending to be Harris’s brother. An imagined demand for Harris was taken as an opening for an opportunist to exploit the legacy using stories from it as a resource. 3. Presenting a statue as an open source for intervention. Although he was teetotal since 1981 Harris’s dominant public legacy continues to be this media-supported image of the wild man. It is this aspect of his fame that was referenced with an unauthorised intervention to his presence in the Bedford Row in 2010. Someone painted the underside of the statue’s nostrils white. Some creative was suitably inspired to visualise a drug reference on to the statue. Harris fought an addiction with cocaine and nearly died of an overdose in 1978. Whether the perpetrator knew this or not the cocaine inference remained until eventually the white marks were spotted and cleaned off. In a previous intervention King Arthur’s inverted sword itself was damaged in an altercation with an oversized delivery van. Factor in the weekend acts of action painting that renders the granite surrounding the statue’s base abstract with fast food and cola stains, then the vision of the authorised image of Harris in Bedford Row remains increasingly in a flux. Anchoring the statue in place. In a casual read, the project seems to have simply wanted to mirror the official process that commissioned a bronze called ‘The Singer from Quimper’ in the nearby Cruises St shopping area in 1992. This particular exercise in city centre regeneration was a notable intervention for its time by the Council and the unquestioned conservative figure spoke simply on its site. This was a direct and uncomplicated process. On paper a facsimile process for Bedford Row must have sought to channel the simplicity of a time when any act seen to ‘combat recession’ which spoke of an agenda of commercial ‘progress’ had unquestioned universal support. The foreword to the Limerick city strategic plan of 2008 even quotes the Bedford Row development as an example of how rejuvenated space prompts ‘significant private sector investment’. Any city centre remodelling post 80’s was reviewed positively. There was not an automatic update for Bedford Row à la Cruises St. The idea of a city centre-shopping base with ‘Art’ as a civic cure-all is not a handed down economic given no matter how neat and attractive the concept is. Commentary of modernist regulation in contemporary city space as critique has profile through the work of Henri Lefebvre who termed the process the (techno-bureaucratic) ‘production of space’. The alternative ‘restoration of ‘a totally human experience’ promoted by Lefebvre is not in evidence here and any consideration of it would register as a complex insertion. The basic thrust of regeneration in the areas of question prioritises these areas’ maintenance and thus the fixed statue amongst paving has a long history as a popular option/solution. A graffiti stencil with the image of the Joker from the Batman film franchise remains on Bedford Row beside the film-based statue of Harris. Funny yet? It asks. On the base of the commissioned statue of King Arthur there is prominent information outlining a mercantile history of the Harris family. This eulogy has a higher word count on the plaque than the actual biographical details of the actor who is surely the presumed focus of the commemoration. Considering this and on balance, the word-count confirms the primacy of the overall agenda designed by the commissioning body. One may speculate on why such detailing is present. This may then focus on the phrase on the front of the statue which states that the bronze is ‘in memory and celebration of Richard Harris, Actor (and) was unanimously approved by Limerick Co Council’. To render any information about the commissioning process in bronze, as part of the object seems excessive. To include the word ‘unanimously’ suggests that those involved in legitimising the process were conscious to emphasise the participation and judgment of the civic authority in all decisions regarding not just Harris’s legacy but issues of artistic merit, location and of course the statue as a figurehead for shopping. Following this hierarchy of information the dominant foregrounding of the family’s mercantile history in Limerick firmly anchors the statue firstly as a component of Bedford Row’s commercial agenda and only then as a representation of an actor who once played King Arthur. However any intended fixed meaning by the council has been undermined by regular interventions. The site generates its own movement. All contents of the location now exist in a twisted bind of unusual sorts. The representative strands combine aspects of the act of shopping, a tribute to the mercantile achievements of the Harris family, (according to the statue they founded the Limerick County Lawn Tennis Club), urbanist actions and the varied associations with the actor’s legacy. In total this statue now hosts active agendas in constant change. The intended, almost romantic, meaning of Harris commemorated as King Arthur is undoubtedly reduced. Doreen Massey defines place as follows. ‘What gives place its specificity is not some long internalised history but the fact that it is constructed out of a particular constellation of social relations, meeting and weaving together at a particular locus. Instead then of thinking of places as areas with boundaries around them, they can be imagined as articulated moments in networks of social relations and understandings, but where a large proportion of those relations, experiences and understandings are constructed on a far larger scale than what we happen to define for that moment as the place itself, whether it be a street, or a region or even a continent’ (12). The brief to physically commemorate a figure associated with the City and present a particular reading in a fixed location has in this case generated a continuous monument unfixed from the commercial figurehead envisaged by a dominant authority in fronting a shopping area. There is another city centre monumental reference to Richard Harris that registers as fixed in its own identity but fluid in another. It is a headstone in the grounds of St John’s Church in John’s Square, one of Limerick’s oldest Christian grounds. 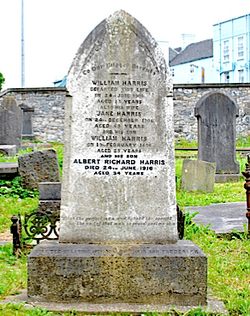 Amongst the weathered graves in the front of the deconsecrated Church, someone spotted a version of the name Richard Harris on a white stone headstone from 1906. 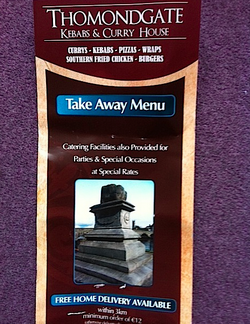 They rubbed that section clean as an imaginary ‘out of copyright’ reclamation of Harris’s name for the City Centre. Within this act of reverse graffiti by another street creative the name Harris has been drawn into the realm of the scrawled commemorations to be seen on buildings from John’s Square to Bedford Row. Harris’s actual ashes are scattered in the Bahamas. In Limerick his memory can now be registered in a matrix created in the fabric of a living city that imagines him having an imaginary barfly brother, residing in a sedate grave in a churchyard whose church building was also once a dance studio, glowering from a secondhand videocassette of The Field in William St, looking brooding from the cover of a greatest hits cd in HMV, in a faded image on the back of a postcard and finally frozen in a bronze statue inspired from a 60s British musical. His legacy mutates yearly, he is continuously being remembered and discussed by the people of in Limerick in Limerick terms. This open reading of a monument for Richard Harris resists the edited version commissioned by Limerick city Council. 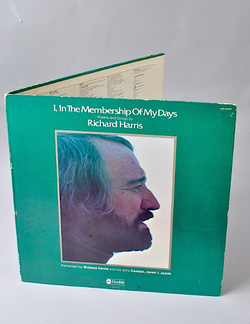 If we designate the council as a dominant authority with an applied subjectivity, then the intention of its ‘mental production’ in regard to a joint commemoration of the legacy of Richard Harris has to be registered as a limited solution supplanted by an agenda that prioritised any reading of the site as primarily a commercial place and not as a repository for a particular Limerick man. This new remapping of the statue in regard to the multiple points of input surrounding the legacy of Harris questions the rationale of the fixed monument when a situation is framed as a complex system in the language of urban planning. Complex systems usually follow nonlinear patterns of cause and effect, which means that most of the situations requiring social interventions require looking for complex forms of causality. The complexity surrounding Harris, his legacy, and his position within a wider process was recognised and simplified to the extent that monument from the city would not invite any complex forms of causality. Commissioning a western civic monument hails a traditional process that errs on the side of the permanent and respects a history of material on a plinth. The subject must be deemed worthy of entry to a civic pantheon irrespective of which city in question. Deviations or expansions within this process are rare. In London a popular competition set around the empty fourth plinth of Trafalgar Square invites leftfield applications that are intended conceptually to expand the site and the text of the monument. Part of any reading generated by this allowed process is of course based in the contrast of a chosen work for the plinth reaffirming the traditional agenda. Once installed, leftfield or temporary presentations on the fourth plinth are tied first and foremost to the Trafalgar site. Limerick’’s most famous monument is The Treaty Stone. This is the reputed object on which the Treaty of Limerick was signed in 1691. In the city its image in all shapes and sizes is familiar as a logo freely used by taxis and many other businesses. It is even neatly replicated carved on another stone monument in Pery Square that commemorates ‘All who died in the service of world peace’. In a continuation an image of that monument is then used as a photo display in the front of the Limerick City Gallery of Art. 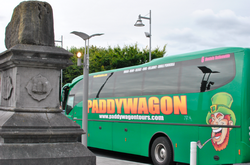 In a Limerick context, The Treaty Stone is a ubiquitous mobile monument, literally in the case of a photo-shopped version that adorns a council refuse van. This unsubtle visual was commissioned as part of an anti-litter campaign and shows a gigantic cigarette being extinguished on the stone. Without a plinth this ‘sign’ is an ambiguous large stone but when elevated and framed by King John’s Castle it commands first and foremost an obligatory status for tourist bus stops as the premier representative icon of the City. The plinth itself is celebrated in commemoration with the large inscription on the side facing the castle that states ‘This Pedestal Was Erected May 1865 John Rickard Tinsley Mayor.’ This in no uncertain terms establishes a civic horizon for the viewer by the size of this inscription. Explanations are registered in smaller type. A fabricated information display outlines the complex chronology that led to the treaty being signed and stands alongside the pedestal. A version of this information is also repeated in bronze at the base of the stone. In fact the site is noisy with the amount of related graphics demanding attention. For example the stone even merits an adjacent plaque that records movement from its previous site 20 feet away (1865-1990). Unfortunately, for years this display has hosted a typo that in one instance informed readers that the Treaty was signed in 1891. Again, the stone is just a ‘reputed’ site of history, willed and accepted into place by city authorities since 1865. Though the typo is small it is still within officially sanctioned text and no less problematic because of its size. Between the ambiguous site of the signing of the treaty and the confusing nature of the date the fixed nature of the site becomes inauthentic and temporal rather than fixed. In 2008 the respected Limerick rugby player Shane Geoghegan was murdered in a case of mistaken identity. His death shocked the immediate and wider community and a response led to a series of public events that united the city in condemming the profile of gang crime synonymous with Limerick City at this time. Many tributes were paid to the deceased and much coverage was given to his commitment in organising and coaching young rugby players. The Pitch for Shane project was devised as a monument to the player’s memory and led by Geoghegan’s aunt Margaret Walsh who is a ceramicist. 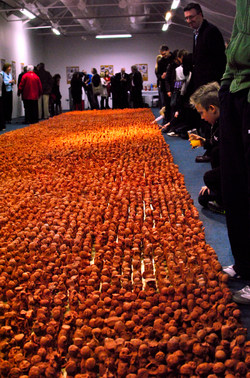 The commemorative artwork involves the creation of 20,000 small figures moulded in clay. 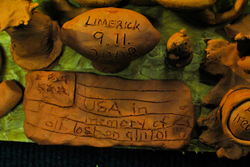 When the target figure was reached, this ‘metaphorical pitch’ was displayed in the civic office gallery space in Istabraq Hall in Merchant’s Quay for 6 weeks. Significantly the creation of the figures is undertaken by the public who were invited to mould the shapes. Each weekend in the city’s Milk Market a stall was set up where members of the public were invited to fashion a figure to add to the field. climbed Everest and placed a small token for Shane at the summit. This is an example of the engaged process that constantly generates a profile for the project and the Shane Geoghegan trust. It invites participation and maintenance as a continuous process that references the low-key achievement in civic work undertaken by Shane in his career and continuously by his supporters. According to the organisers it stands also as a monument to victims of violence. The trust aims to offer children a range of community-based sporting and creative activities as alternatives to anti-social behaviour. 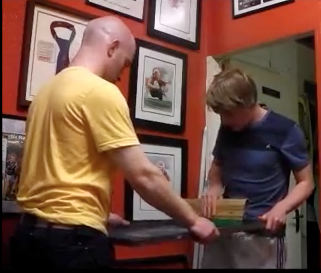 The process is referenced through a reading of art out of necessity. 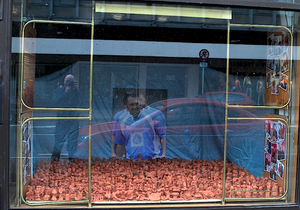 The project’s inspiration according to Margaret Walsh drew on the collective image of the Chinese Terracotta Army. Other factors included an awareness of the year of the Volunteer and the year of Crafts combined with the city hosting the European Year of Sport. The ensuing profile combination allowed the memorial team a publicity stream on the subject daily. No reference is made to the remarkable visual similarity of the two projects in any of the commentary or reviews of the Pitch for Shane. While visual similarities are impossible to ignore, the concept brief and the nature of the respective colaborative practices are diametrically opposed. It is not known whether Gormley is aware of the Pitch project in Limerick. THE MAN WHO TOLD A JOKE AT HIS OWN FUNERAL. There stands in Limerick one monument to a man who entertained and supported Rugby with a passion and is continuously celebrated by those who knew him. Here is a statement on the man and the monument to him by one of his friends. Jock Hunter, wayward son of a Scottish judge, drifted into Limerick after thirty feckless years roaming the world. In search of an old colleague from The Northern Rhodesian police, Jock also found a family. In Limerick, he discovered all the things he loved: rugby, storytelling, fly-fishing, good conversation and a willing audience for his tall stories. When he died, his friends created Jock’s Block in his memory, constructing it with some of his ashes and a great deal of love. Today, the block sits outside the White House pub, where Jock held court and where he related some of his finest fibs. The details of Jock’s commemoration are of interest in their own right but also as a contrast comparison to any fixed commemoration. When Jock died he was in the process of recording a series of audio pieces for a children’s tale written by a local writer. At his wake a recording of Jock telling his favorite joke was played as part of the ceremony. Afterwards his friends decided that his memory should be kept alive in a manner that reflected his contribution to a particular place. It was important that any representation of his character should physically communicate this in Limerick. This became the brief. Funding was raised and a decision reached on a monument. A two-foot concrete cube was finished with a small brass plaque fixed on top. The plaque simply said, Jock Hunter, a proud Munster Man. Born Duirinish Scotland 6th February 1940. Died Limerick 12th July 2004. Made for him by his friends. The block was a repository. It was collectively built by those who oversaw his cremation and as a living vessel for his ashes. 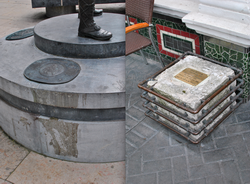 The ‘seat’ containing the ashes was placed permanently outside the White House Bar in O Connell St. It is a monument commissioned by a community of interest, a sculpture, a resting place and a talking point. One touch that registered the block as sculpture was the lengths of copper plumbing pipe that surrounded the concrete. Jock was not the best plumber in the world and the physicality of this inside joke resonates with the intimate audience while gently puzzling others. Any regular of the White House will take queries on the block. They will give details on both the construction and the history of the man. Jock therefore is creatively remembered as precisely as it is possible for a character to be remembered. This welcoming invites a common ownership of Jock’s legacy as each visitor spreads the story. Jock’s Block is a significant example of the lateral possibilities surrounding the construction of a monument in extrovert space. In 2011 as part of the Catherine St CATDIG festival curated by The SpiritStore Art Project, one of Jock’s friends produced and performed a short monologue based on the man in Bourke’s Bar in Catherine St. Titled ‘The man who told a joke at his own funeral’ this performance was billed as a celebration. To a full house of friends and the curious, the monologue was performed around the actual block which was lent for the duration by the White House. This commemoration will continue and with this and any similar project the lateral possibilities will always challenge fixed meanings. ‘’An author who teaches writers nothing teaches no one. What matters, therefore, is the exemplary character of production, which is able, first to induce other producers to produce, and second, to put an improved apparatus at their disposal. And this apparatus is better, the more consumers it is able to turn into producers – that is, readers or spectators into collaborators’’. Walter Benjamin. Before he died Harris feared that he would be best known for the role as Dumbledore in the Harry Potter movies. In a short sentence the site www.deadoraliveinfo.com presents a description of his career begining with his role in Camelot and finishes with his Dumbledore role. Thirty years separated the roles. Contemporary compilations of the Late Late Show interviews introduced by Gay Byrne do not now concentrate on the charm of his guests’ tales of drunken benders. Initial web searches for Harris interviews will flag the following. Conan O Brien. 1998 ‘the late great Richard Harris drops by to entertain us with tales of his alcoholism. The first quote underneath this Youtube clip reads ‘A real legend man, makes me proud to have Irish blood in me’. 4. Grant Kester. Dialogical Aesthetics. Conversation Pieces university of California press 2004 p90. 7. Michel De Certeau. The Practice of Everyday Life. University of California Press. Xxv111. 12. Doreen Massey. PLACE. Ed Tacita Dean and Jeremy Miller Thames and Hudson 2004. p104. 14. Jane Rendell, Art and architecture: a place Between (London: I.B. Tauris, 2006).